It had been a while since I last observed objects in HEO (Highly Elliptical Orbit). 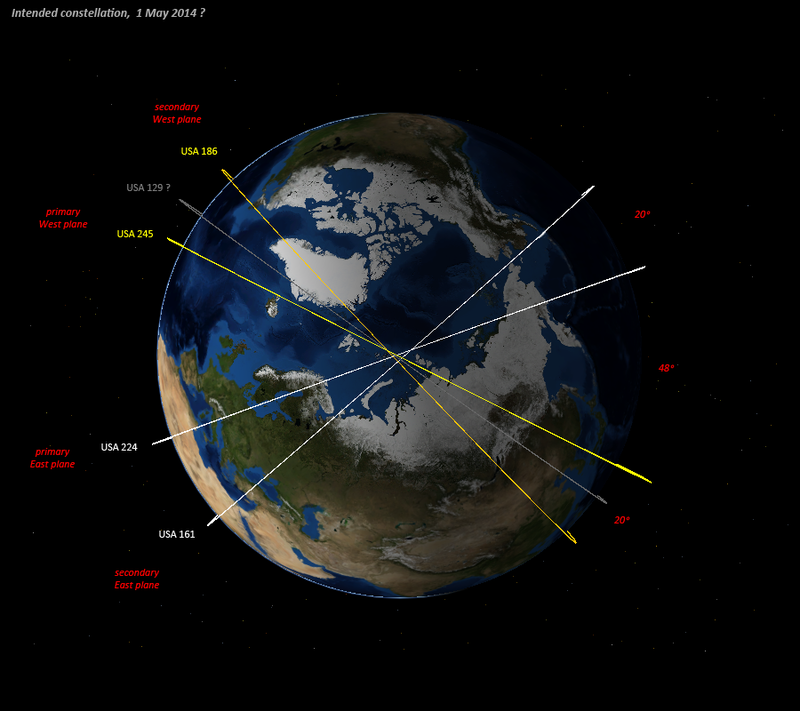 Most of my recent focus has been on the KH-11 in Low Earth Orbit and on geosynchronous objects. 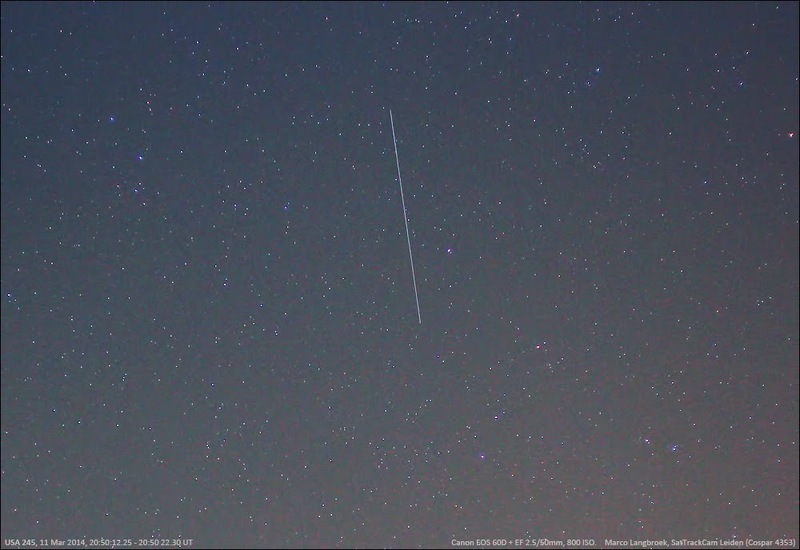 Last Saturday evening I however targetted USA 184 (2006-027A), a classified US military satellite in HEO which hovered almost in the zenith for my locality during the observation. 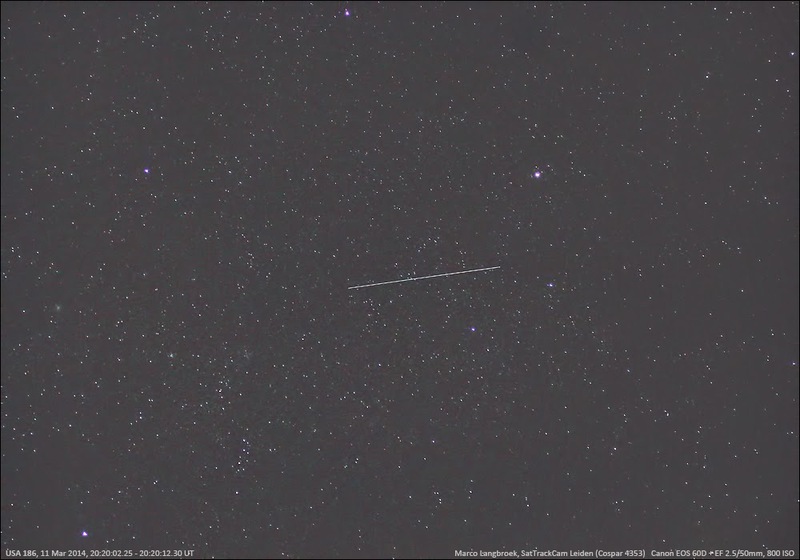 It is the tiny trail indicated by the arrow in the image above, taken with my Canon EOS 60D and a 2.8/180mm Zeiss Sonnar MC. Stars in the image belong to Ursa maior. 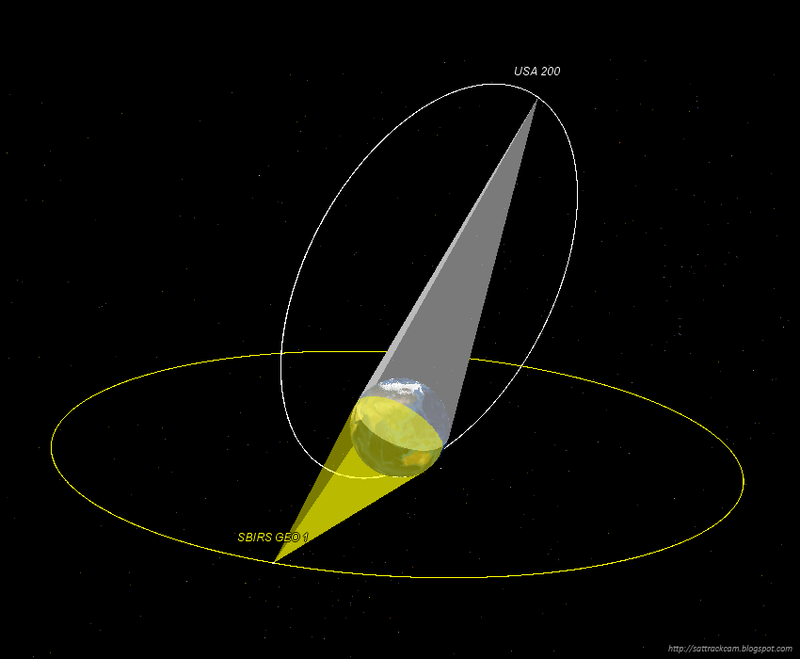 A Highly Elliptical Orbit (HEO) is an orbit which is highly eccentric ("elliptical") with a low perigee at only a few hundred kilometers altitude (usually in the southern hemisphere) and a high apogee, often in the 20 000 to 39 000 km altitude range. The orbit is typically inclined by about 63 degrees. 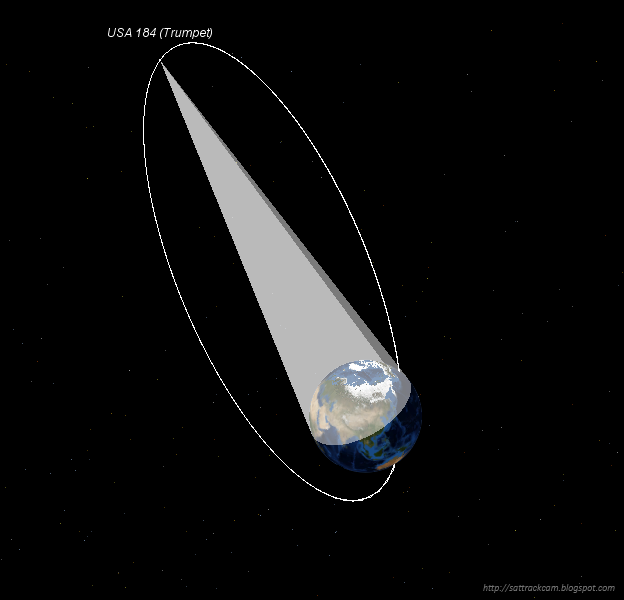 USA 184 is in a 63.58 degrees inclined, 1590 x 38 760 km orbit. 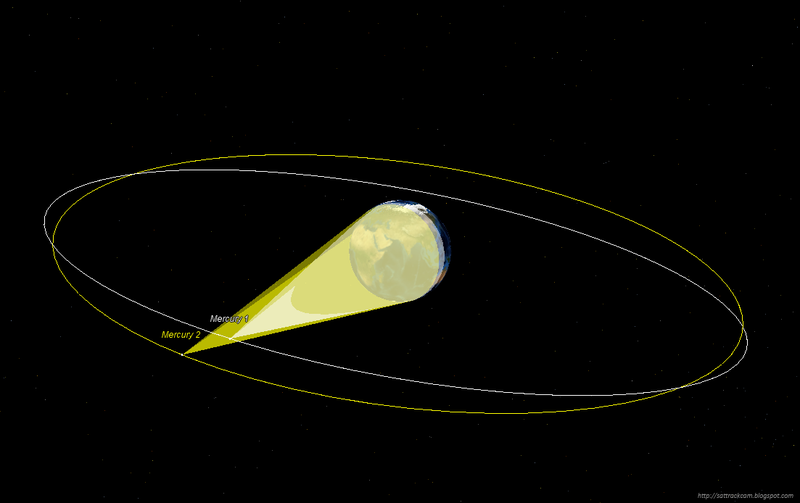 Satellites in such an orbit spend a long time near the apogee of the orbit. As a result, they hover high above the northern hemisphere for many hours a day. 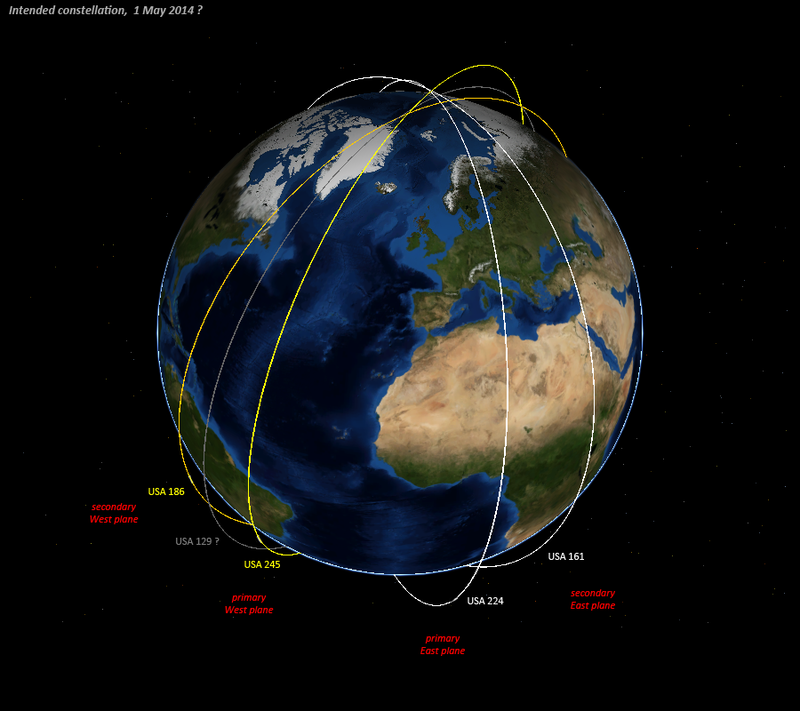 Just like a geosynchronous orbit, this allows long duration coverage of a (large) area. 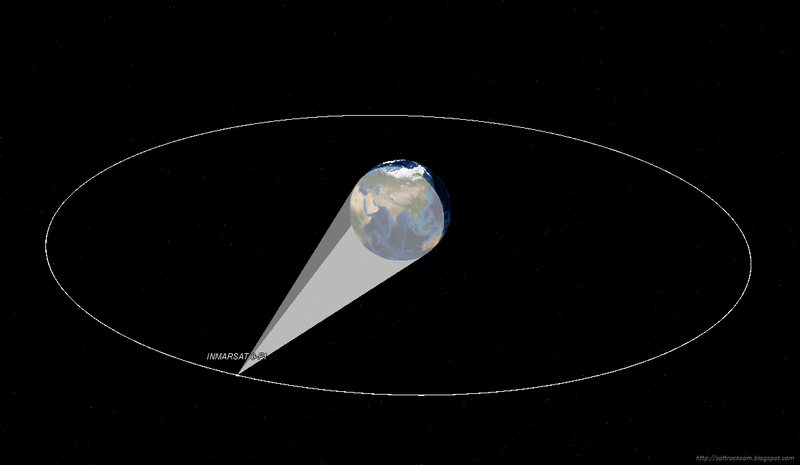 The difference with a geosynchronous orbit is that a HEO orbit is well suited to cover high polar latitudes, while a geosynchronous orbit has a poor coverage of such high latitudes. 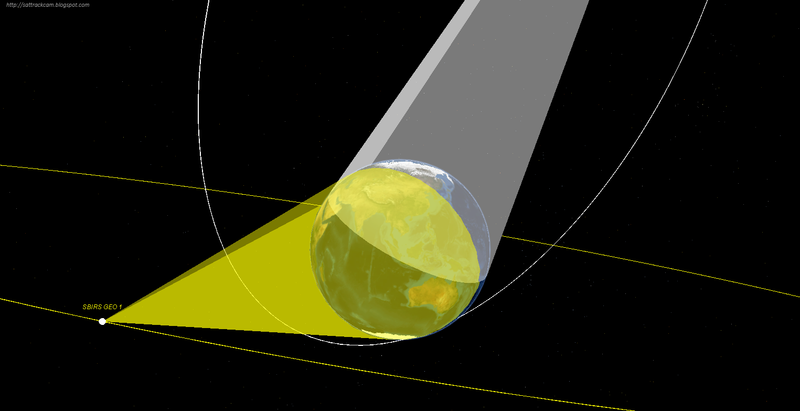 HEO orbits are therefore typically used for applications that demand long-duration coverage of high Northern latitudes. It concerns communications satellites (notably by the Russians), SIGINT satellites and Infrared Early Warning satellites. USA 184 falls in the latter two categories. It is a TRUMPET-FO (the FO stands for "follow-on", i.e. it is an improved version of the older TRUMPET) SIGINT satellite. 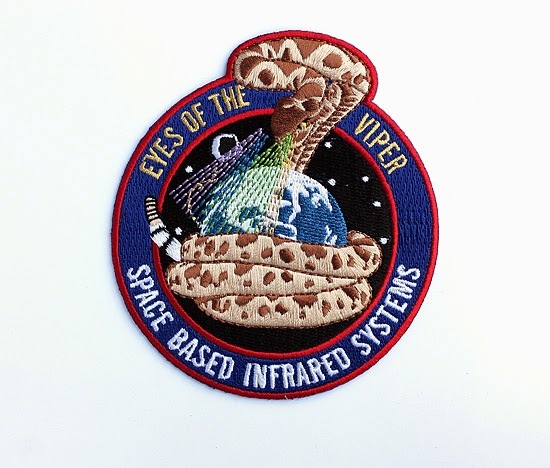 In addition, it has a piggyback SBIRS (Space Based Infrared System) package, which is dedicated to the detection of ICBM launches by their Infrared signatures. 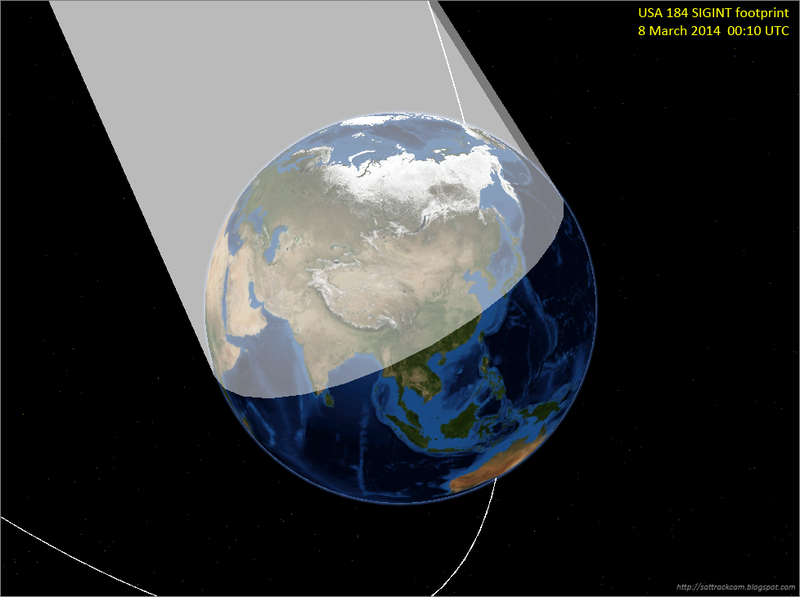 It is one of two HEO sensors in the SBIRS system (the other one is on USA 200, 2008-010A), in addition to the two dedicated SBIRS satellites in geostationary orbit (SBIRS-GEO 1 and SBIRS-GEO 2, 2011-019A and 2013-011A). note: the orbital diagrams were made with JSatTrak software and amateur orbital elements calculated by Mike McCants. In several previous posts from September 2013 onwards, I analysed and prognosed changes to the KH-11 Keyhole/KENNAN/CRYSTAL optical reconnaissance satellite system. 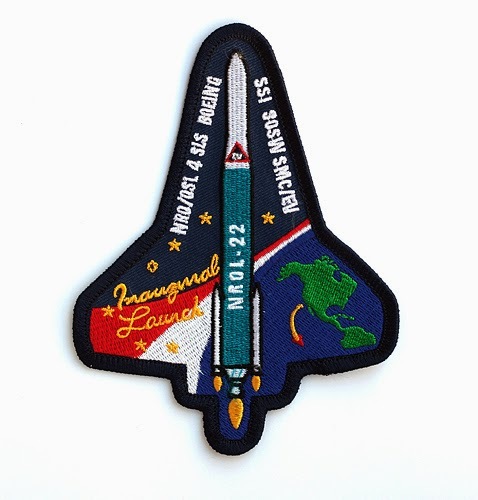 Main focus was on the changes, notably in the orbit of USA 186 (2005-042A), following the addition of USA 245 (2013-043A) as a replacement for USA 186 in the Keyhole primary West plane. Indeed, as predicted, USA 186 was moved out of the primary West plane, and started to drift towards the secondary West plane in mid-November 2013 following a manoeuvre that changed its inclination and made it loose sun-synchronisity. Late 2013 and early 2014, I expected that the drift would end early February 2014, when the RAAN difference between USA 245 and USA 186 reached 10 degrees, the old separation between USA 186 and USA 129, the former primary and secondary West plane satellites. I was proven wrong with my prediction, when USA 186 continued to drift past that date. I then turned to a second scenario: that the intended RAAN difference between USA 245 and USA 186 will be 20 degrees, similar to the difference between USA 224 and USA 161 in the East plane. An open question is what will happen to USA 129 (1996-072A), the over 17 year old former secondary West plane satellite. I still think it will be de-orbited somewhere this year. But I have been wrong before. Note: the orbits for USA 129, USA 186 and USA 245 in the West plane in the images above are based on recent observations. 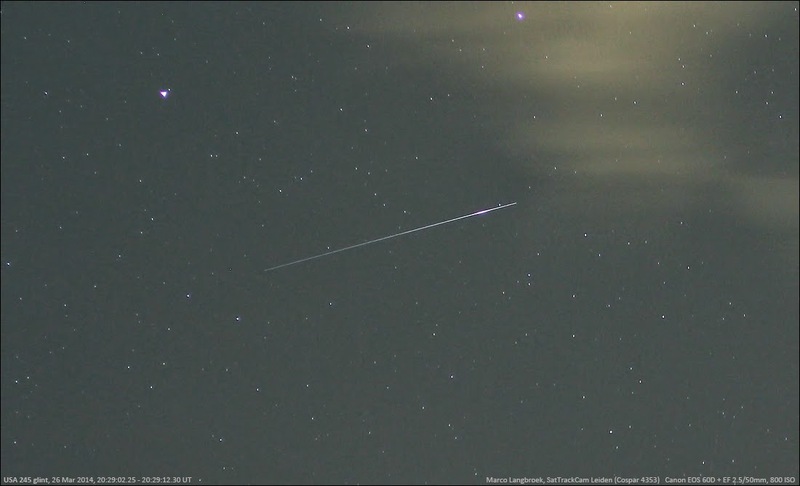 The East plane satellites USA 161 and USA 224 have not been observed since autumn 2013, and will not be visible from the Northern hemisphere before mid-April. There is therefore a possibility that one or both have moved, but since we have no information on their current whereabouts, I have depicted them in their 'old' orbital planes of the autumn of 2013 relative to the West plane. Wednesday evening saw a dynamic atmosphere, where clear skies intermittently were broken by fields of fast moving scattered clouds. I targeted all three West plane KH-11 Keyhole/CRYSTAL satellites that evening: USA 129 (1996-072A), USA 186 (2005-042A) and USA 245 (2013-043A). USA 245 twice flared brightly during this pass. Such flares are caused when a reflective surface on the satellite (solar panels, an antenna panel, a dish or some other part of the structure) acting like a mirror reflects sunlight directly towards the observer. I love it when they do that, it is always spectacular. 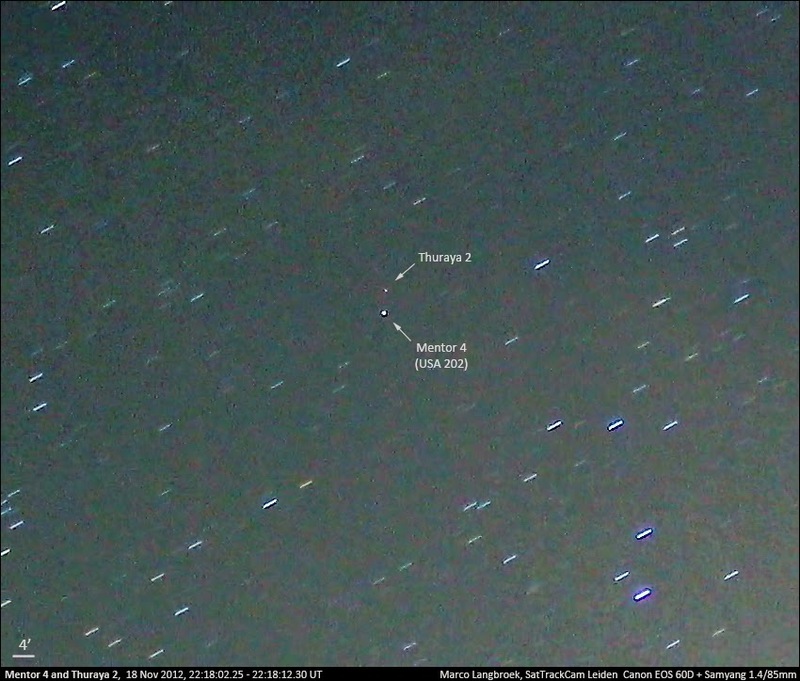 USA 129 was also observed, low in the west while emerging from earth shadow. It only faintly registered on one image, allowing one position determination. USA 186 was not seen, but this was likely due to unfavourable circumstances (it was too faint for the lens used) as Cees Bassa did observe it, on-time, the next day. One by one the KH-11 Keyhole/CRYSTAL optical reconnaissance satellites are emerging from the Northern hemisphere winter black-out. Following USA 186 (2005-042A) on Feb 21, and USA 245 (2013-043A) on March 3, USA 129 (1996-072A) has now been recovered as well on March 21. This means all three objects in the West (evening) plane have now been recovered. Recovery of the two East (midnight) plane objects (USA 161 and USA 224) will have to wait until mid-April. I went to my secondary site in the Cronesteyn polder in the evening of March 21, with the explicit aim of recovering USA 129. I had aimed the camera, with the 1.4/85mm lens, at 33 degrees elevation, at a point covering the orbital plane of the satellite where it should just have emerged out of earth shadow. And it did, 104 seconds late and 0.8 degree off-track from the orbital elements based on Greg's last observation of Feb 12. Running a series of images for several minutes, I snapped it on two images. 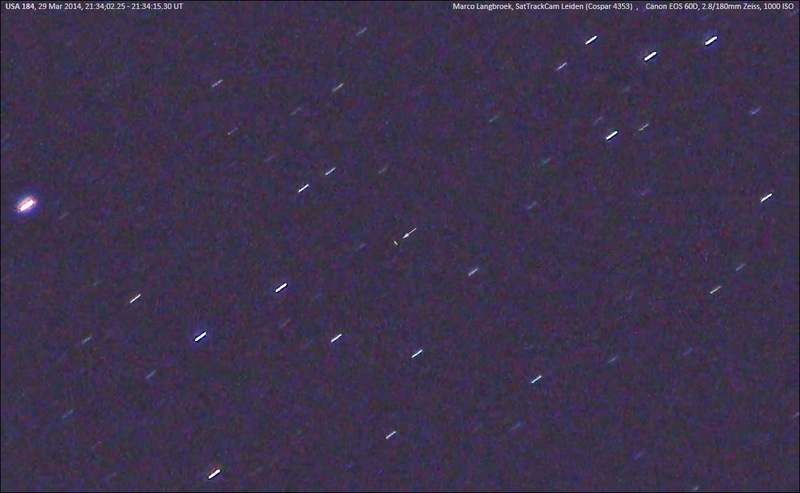 In Almere (also in the Netherlands), some 55 km Northeast of me, Leo Barhorst also captured it using his WATEC camera, and reported it as an "unknown". 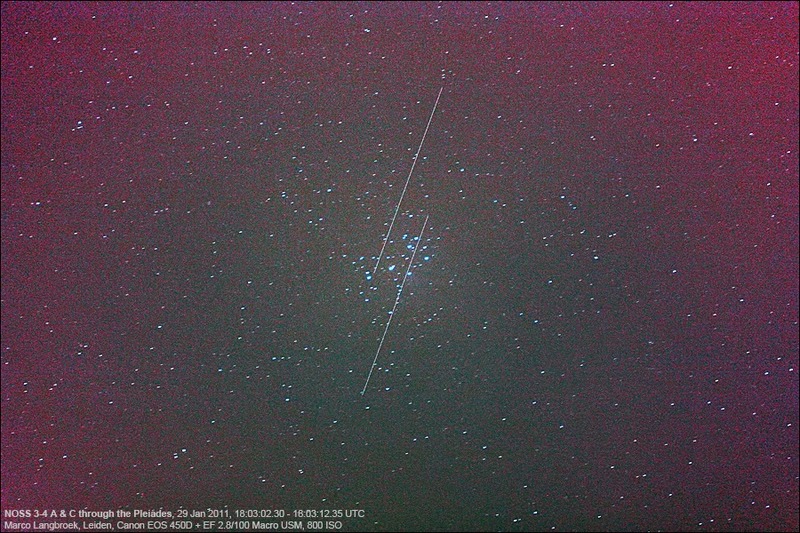 Over the coming days, we hope to capture more positions as the satellite gradually becomes more visible. 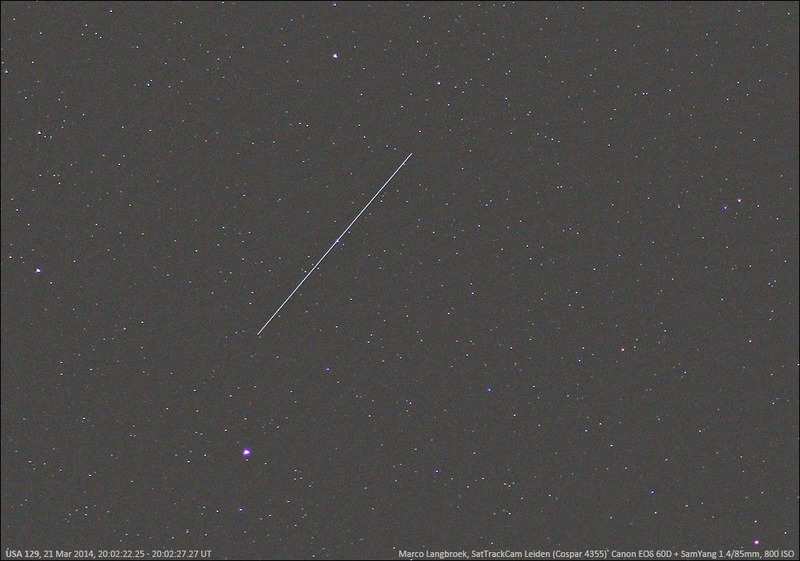 That same evening, I photographed two other classified objects: USA 186 (2005-042A, above, with two strays Russian rocket boosters in the image as well) and SAR-Lupe 5 (2008-036A), a German military Synthetic Aperture Radar satellite. SAR-Lupe 5 was captured by accident, when I was making a test image to check lens focus. 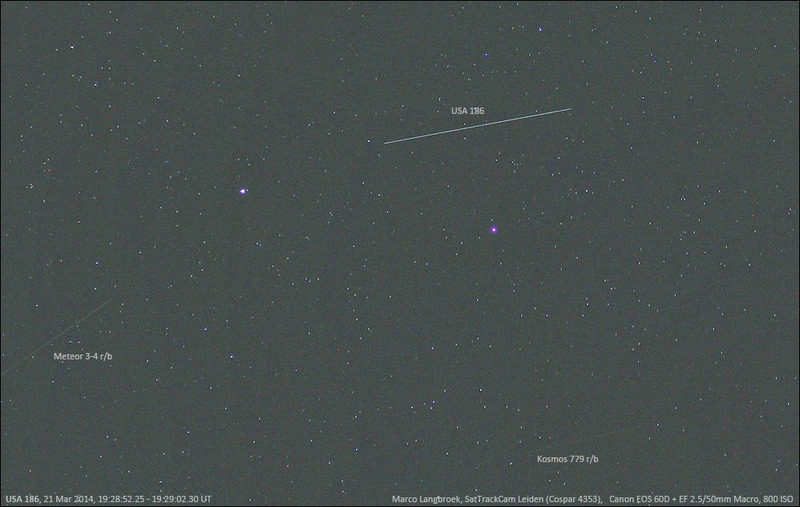 Two satellites showed up in the test image: the very old Russian weather satellite Meteor 1-5 (1970-047A) and SAR-Lupe 5. As I had not carefully timed this image (I did not expect a classified object to be in it), Meteor 1-5 provided a welcome time calibration for the image. 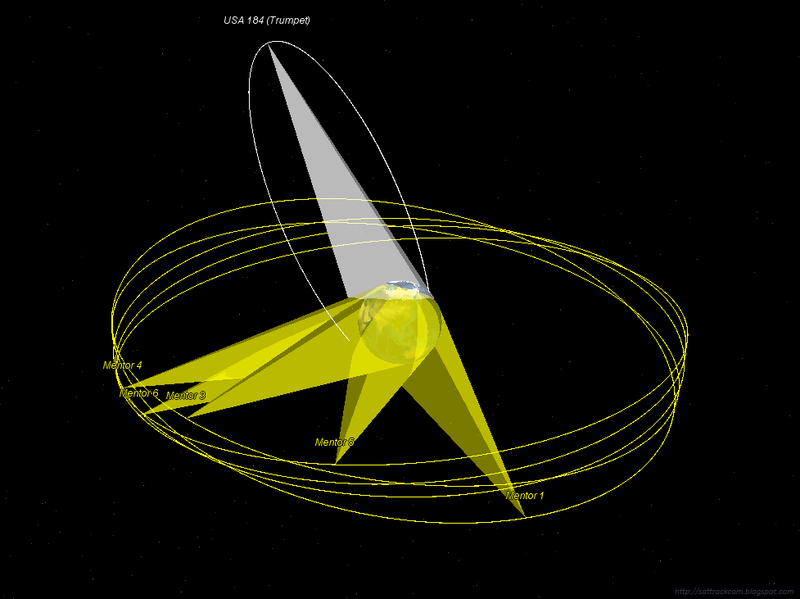 SAR-Lupe 5 was 57 seconds early and 1 degree off-track relative to 10-day old orbital elements. 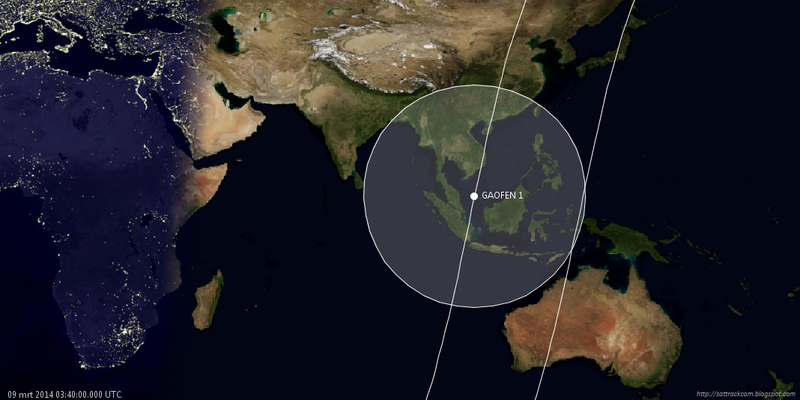 Open Question: Could US Military SIGINT satellites help to narrow down flight MH370's last location? Over the past days, it has become clear that the lost Malaysian Airlines flight MH370 has flown on for some 7 hours after contact was lost at 17:20 UT (March 7 UT, local March 8). 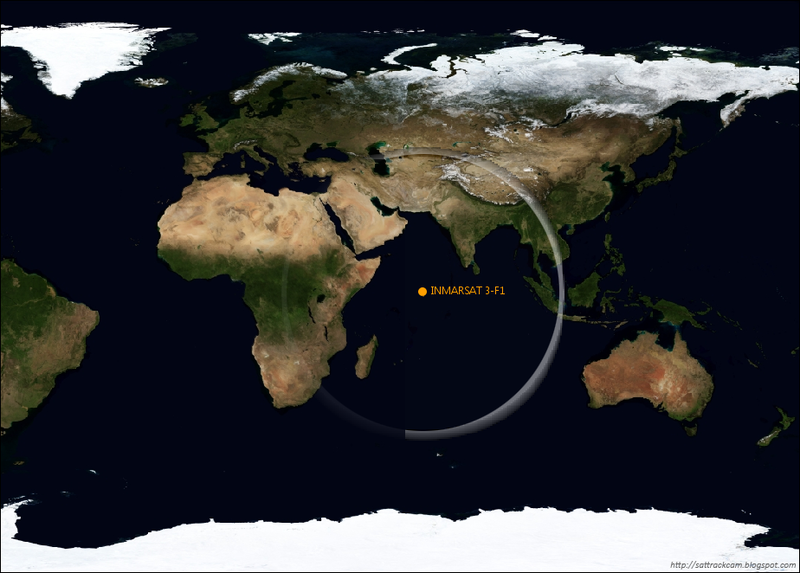 This information comes from radio "ping-backs" of the aircraft's ACARS system received by the Inmarsat 3-F1 satellite, a geostationary communications satellite that is located at longitude 64 E over the Indian Ocean. These ping-backs were received hours after the last radio contact with the pilots and hours after the transponder was shut off, and indicate that the aircraft was still powered and 'alive' hours after it disappeared. A well written story at the CNN website gives backgrounds on the receptions and the system. In this post, I will briefly summarize how Inmarsat 3-F1 detected the aircraft and determined a wide arc where the aircraft could have been at that time. I will then explore whether additional signal receipts by classified US Military Signals Intelligence (SIGINT) satellites might perhaps have been possible. If such additional receptions exist (an open question!) they would enable to further narrow down the location of the last ping-back. That will largely be a theoretical exercise, as so far there has been no word that the US SIGINT satellite constellation did detect these ping-backs. This post therefore entails a clear element of speculation, and the central question remains an explicit open question. Someone in the aircraft shut off the radar transponder beacon and the active ACARS messaging system near 17:20 UT. Yet this did not fully disable the ACARS system. The system kept answering periodic "pings" by the Inmarsat 3-F1 (1996-020A) satellite. These "pings", basically a kind of "Marco?" message, are periodically sent out by the satellite and when received by the aircraft ACARS antenna, the aircraft pings back a brief "handshake" basically saying "Polo!". While such a handshake does not contain clear information about where the aircraft is when the active ACARS is disabled, it does contain the aircraft ID. According to press reports, the last ping-back from flight MH370 was received 7 hours after the flight disappeared, near 00:11 UT on March 8. Apparently, only Inmarsat 3-F1 received these ping-backs. From the time it took the radio-ping to travel from Inmarsat 3-F1 to the aircraft and then back again, the distance (but not direction) of the aircraft to the satellite can be determined. For example, at a radiowave speed of 300 000 km/s, a time difference of say 0.2 seconds between Inmarsat sending the ping and receiving the answer back, indicates the aircraft is at a distance of 30 000 km from the satellite. 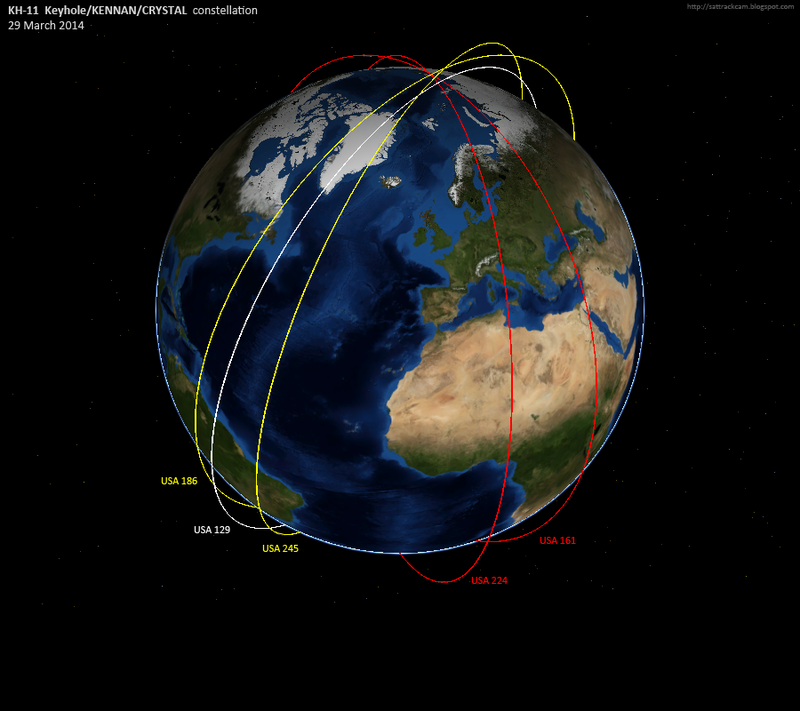 Once you know the distance, you can draw a globe with that radius around the location of the Inmarsat satellite. Where that globe cuts the earth surface, it creates a circle, centred on the sub-satellite point. The aircraft must have been somewhere on that circle. This is basically how the wide arc that has been published was constructed, an arc which runs from Thailand to Kazakhstan in the north, and Indonesia to Australia and the Indian Ocean in the south. The aircraft could have been anywhere on that big arc, an area stretching thousands of kilometers. 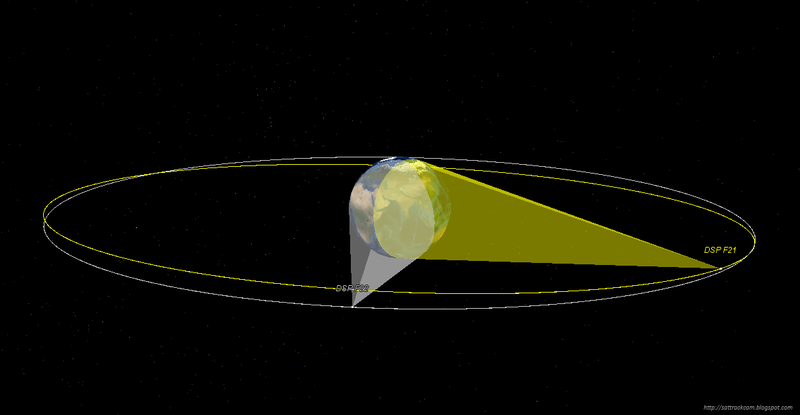 To pinpoint the aircraft more accurately to a particular spot in the arc, one needs a detection by a second and preferably a third satellite. Could US SIGINT satellites provide additional receptions for these pings? One source of such additional ping-back signal receptions, in theory could be one of several Signals Intelligence (SIGINT) satellites employed by the US military. Please note that I say IN THEORY as the US government hasn't provided any statements that they did (which might indicate that they didn't). In other words: I am speculating on an open question here. It depends on a lot of factors, not the least of which are questions whether these satellites were listening at the time, and whether they were monitoring the particular VHF/UHF radiofrequencies in question. Those are questions I do not have the answers to. What I will do, is discuss which US military satellites could potentially have received these ping-backs because they had coverage of the area. 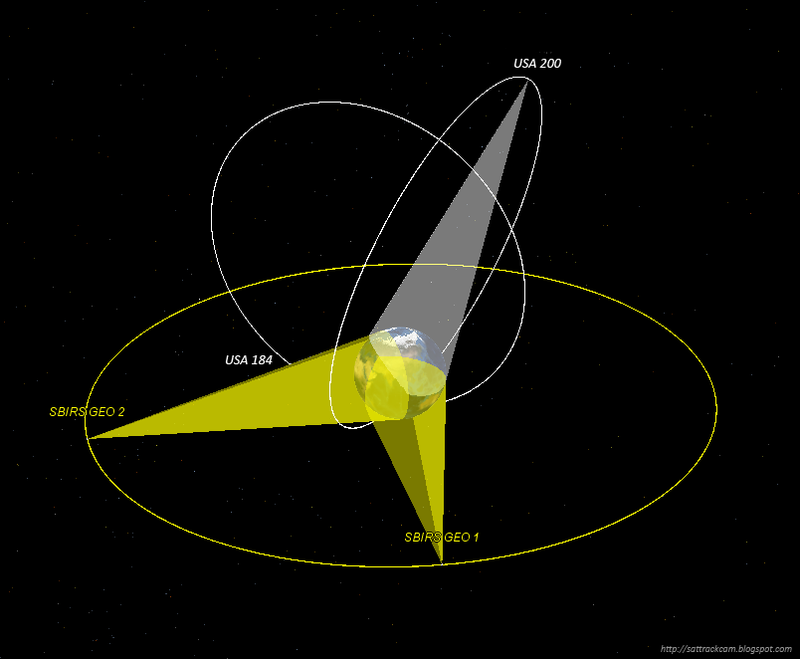 Two US SIGINT systems in high orbits cover(ed) the relevant area: (1) several of the very large Mentor/Advanced Orion SIGINT satellites in geostationary orbit: and (2) one of the SBIRS/TRUMPET combined SIGINT and SBIRS satellites which moves in a Highly Elliptical Orbit and hovered high above the northern hemisphere at the time. These SIGINT satellites serve to eavesdrop on radio communications including satellite- and mobile telephony, missile telemetry and signals from groundbased and airborne radar systems. The TRUMPET satellite in HEO which had coverage of (a part of) the area at that time is USA 184 (2006-027A). 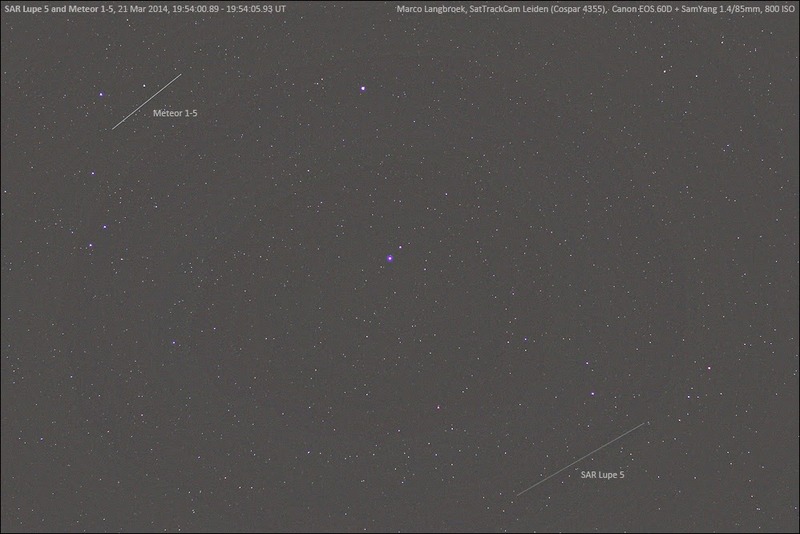 The geostationary Mentor satellites covering the area are Mentor 1, 3, 4, 5 and 6 (1995-022A, 2003-041A, 2009-001A, 2010-063A and 2012-034A). 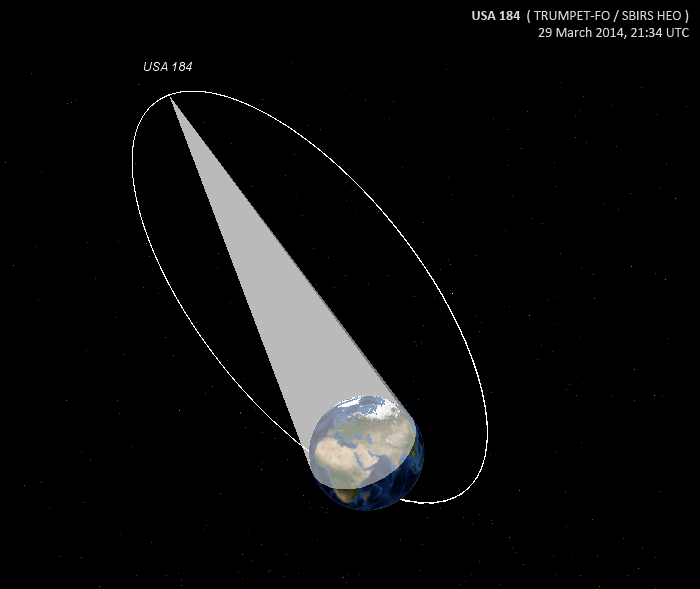 Apart from the Mentor and Trumpet SIGINT satellites in high orbits, the US also operates a series of SIGINT satellites with accurate geolocalization capabilities in a Low Earth Orbit. It concerns the US Navy Naval Ocean Surveillance System (NOSS) satellites, of which there are several. They operate in close pairs, orbiting at an altitude of about 1000 x 1200 km in 63 degree inclined orbits. Their main purpose is to locate and track shipping through the radio communications of the latter. Two duo's of NOSS satellites were covering the northern half of the area at the time of the last ping-back received by Inmarsat 3-F1: the NOSS 3-5 and NOSS 3-6 duo's (2011-014A and B and 2012-048A and P). 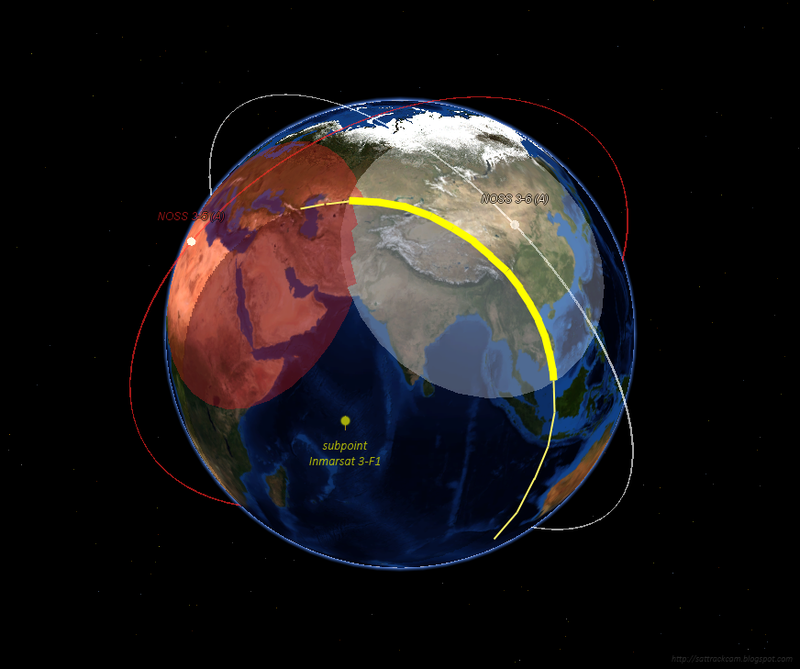 China operates a satellite system similar to the US NOSS, consisting of three satellite trio's in the Yaogan series (Yaogan 9A, B, C; 16A, B, C; 17A, B, C). None of these however had coverage of the relevant areas in the Indian Ocean, central Asia or southern Eurasia at that time. 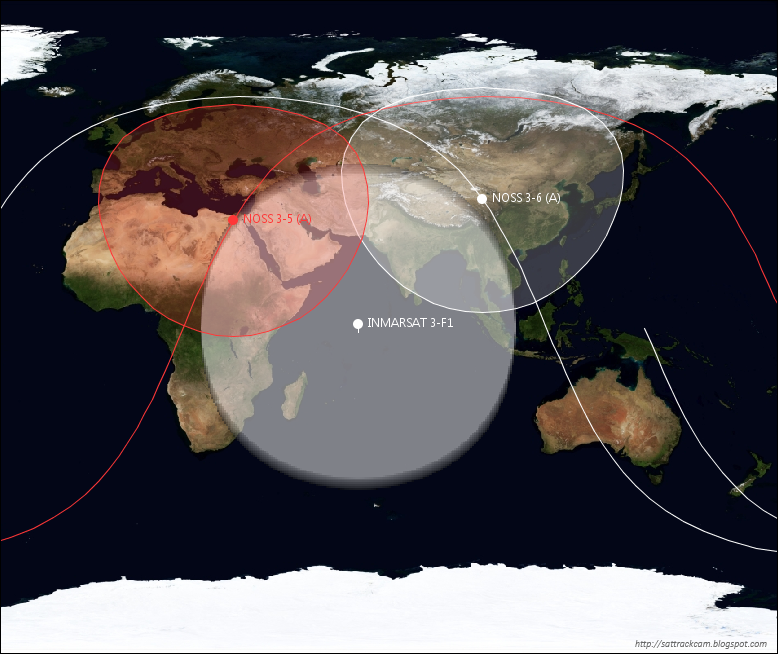 From the brief satellite coverage analysis summed up above, it seems that the northern overland arc from Thailand to Kazakhstan was potentially well covered by various US military SIGINT satellites: five Mentor satellites, a TRUMPET and a NOSS duo. The southern Indian Ocean arc is slightly less well covered (no TRUMPET or NOSS coverage) but was nevertheless in view of several geostationary Mentor SIGINT satellites. The question now is: could one or more of these SIGINT satellites have captured the same ACARS ping-backs received by Inmarsat 3-F1? If so, the combination of their data with the Inmarsat data could potentially narrow down the last known position of the aircraft considerably. It all depends on whether the satellites in question were actively listening at that time, and moreover, whether their monitoring includes the radio frequencies in which the ACARS ping-backs of flight MH370 operated. It perhaps also includes questions like whether any signals received are all kept on file, or if some selection is made and much deemed of no interest is directly discarded. Those are some big serious "ifs", that I simply do not know the answers to: this stuff is, after all, classified. So far, the US government has not indicated that one of their SIGINT systems did capture the ping-backs. Which might mean that they didn't, as I can't imagine that they did not check for it. Classified SIGINT satellite positions in this post (and previous posts) are based on orbits calculated by Mike McCants, based on amateur observations communicated on the SeeSat-L mailing list. In my initial analysis posted 17/03/2014, I forgot to include two other and older geostationary US SIGINT satellites: the two Mercury/ADVANCED VORTEX satellites that are located over East Africa. It concerns Mercury 1 (1994-054A) and Mercury 2 (1996-026A). 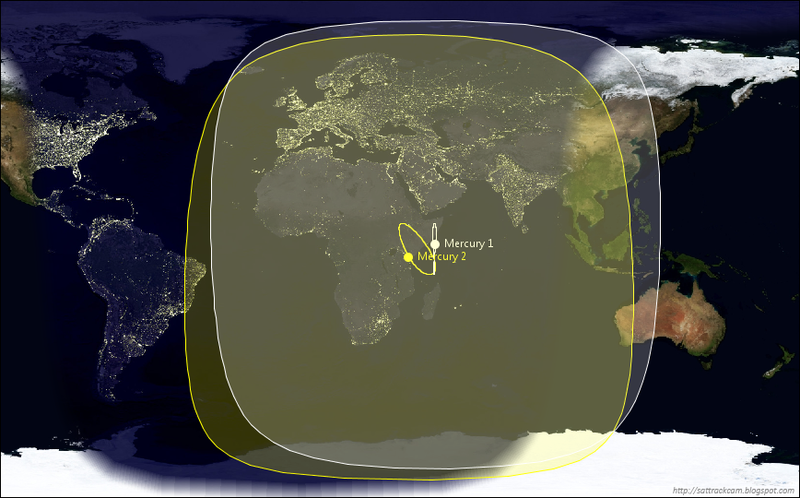 Both satellites were recently moved to a new orbital position over East Africa and are station-keeping there, indicating they are operational. Their footprint includes the area of interest, although the southern Indian Ocean arc is close to the edge of their coverage. My previous blog post "Satellites and Malaysian Airlines flight MH370" garnered some attention. I was called by an editor of 'Nieuwsuur' ("News Hour"), a major news show on Dutch national TV channel 2, if I was willing to explain something about it in an item on their news show (broadcast nationwide daily at 22:00 CET). So yesterday afternoon I was visited by an interviewer and a cameraman, for an item broadcast yesterday evening. Below is a video of the item (it is in Dutch of course): I appear at 3:08 and again at 4:25 in the video. In the item I briefly talk about the use of SBIRS to look for a mid-air explosion; and that I expect the US military to use their optical reconnaissance satellites to image every suitable landing strip within operational reach of the aircraft. Other experts in the item are the Volkel Air Force base commander and fighter pilot Peter Tankink and TU University Aerospace researcher and pilot Alexander in 't Veld. 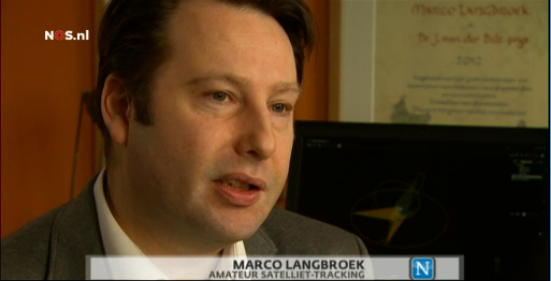 This is the second time I appear in Nieuwsuur: a year ago I was live in their broadcast in an item on the Chelyabinsk meteorite/asteroid impact (see my post here). 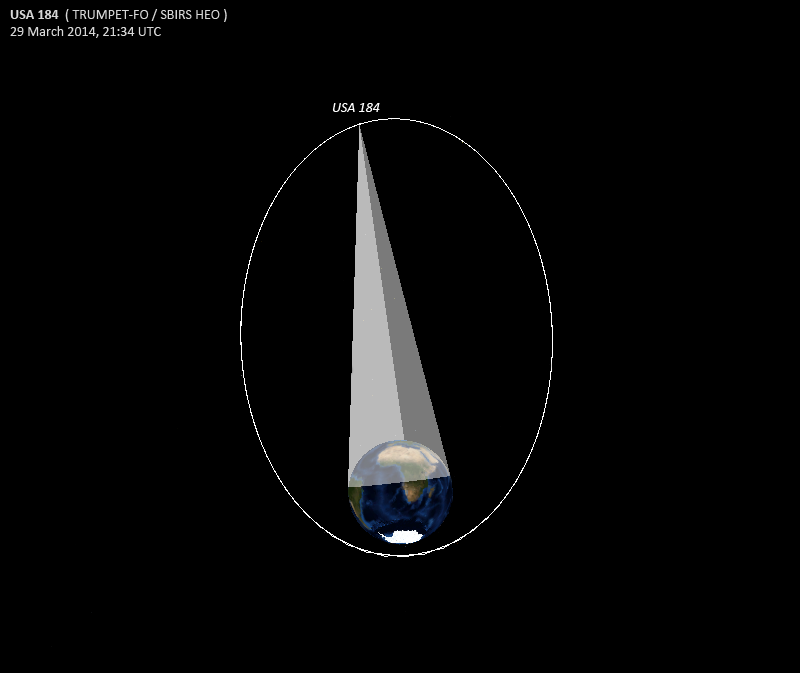 One by one the KH-11 KENNAN/CRYSTAL ("Keyhole') optical reconnaissance satellites are emerging from their winter blackout on the Northern hemisphere (see a previous post). After USA 186 (2005-042A) in the secondary West plane late February, now USA 245 (2013-043A), the new primary West plane satellite, has been recovered. 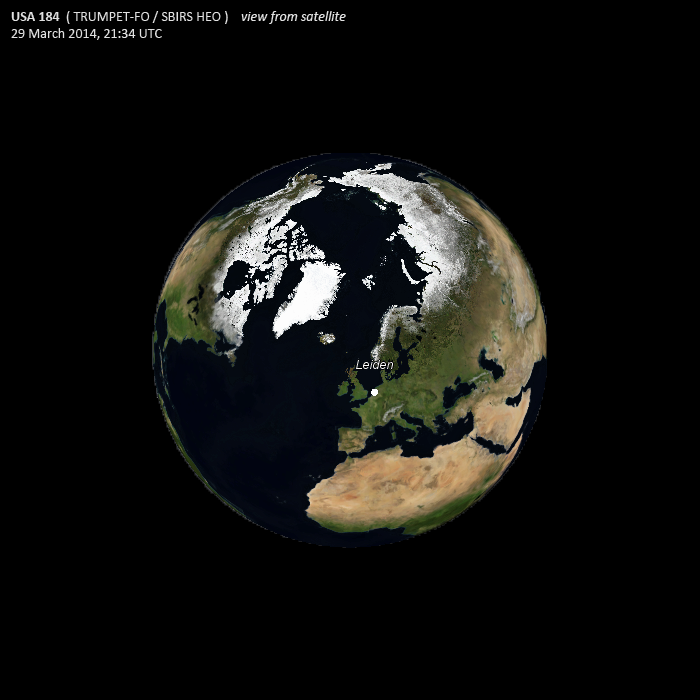 During wintertime the KH-11's are not visible from the Northern hemisphere: they are eternally eclipsed by the earth shadow during these months. Only late February/Early March they reappear. Observations during the Northern hemisphere winter season solely rest on the shoulders of our single Southern hemisphere observer, Greg in South Africa. He starts to lose sight of the West plane KH's late January to early February. 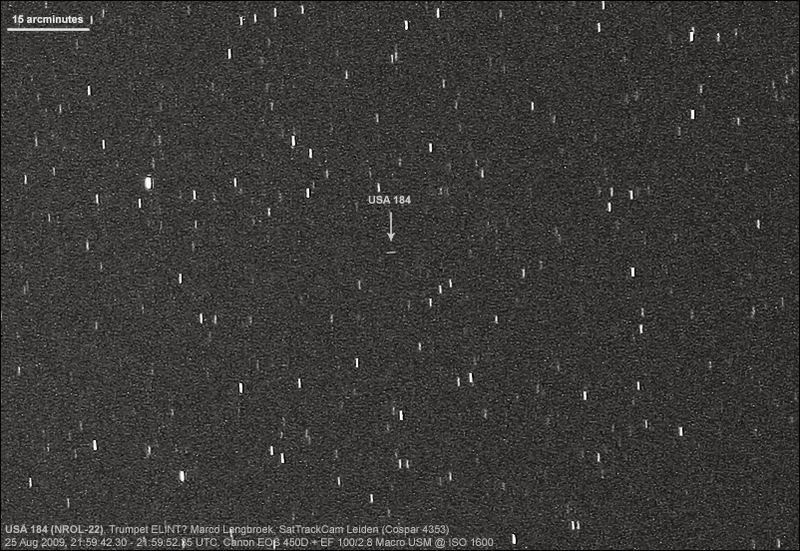 I did a failed attempt to recover USA 245 on March 3, continuously imaging its last known orbital plane for 19 minutes (10 minutes before and 10 minutes after the nominal pass time). Nothing was seen. I should have kept on the attempt longer: Russell Eberst in Scotland was more lucky that evening and got a single position. It turned out it was even more late (36 minutes) than the time period covered by my attempt. 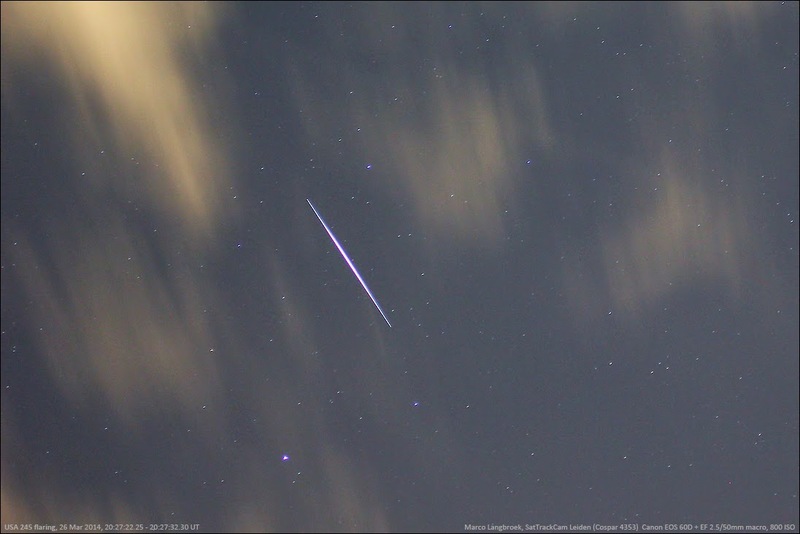 The next person to observe it was Cees Bassa in the Netherlands on March 8. The next day, March 9, it was finally my turn and I could do my first post-winter-blackout observations! Several other observers (e.g. Jon Mikkel in Spain, Leo Barhorst in the Netherlands) also picked it up around this date. I was nearly fooled on March 9 by a bright object that appeared about two minutes before USA 245, moving along a similar track. It turned out to be the French optical reconnaissance satellite SPOT 4 and not USA 245 being too early. Luckily, I kept photographing and soon captured the real USA 245. The hunt is now on for the third of the West plane objects, USA 129 (1996-072A) which should be slowly emerging from invisibility, at first only very low in the North, but soon higher in the sky during the last week of March. 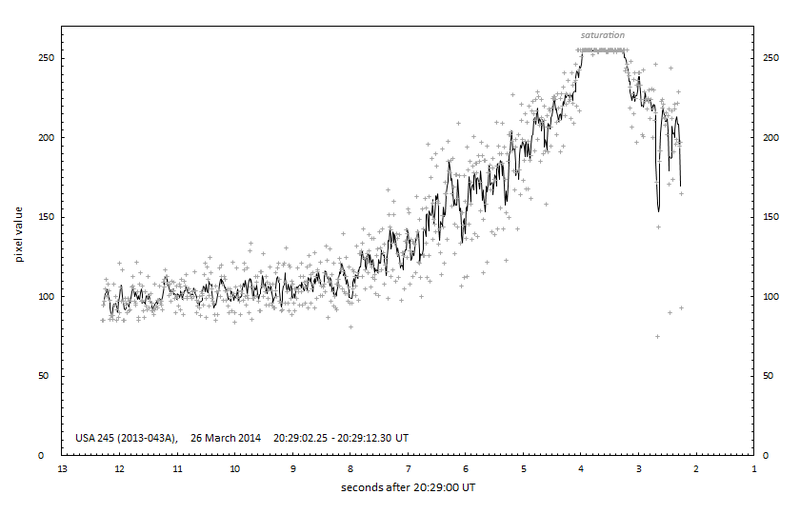 It was manoeuvered into a much lower orbit near January 27 (see a previous post). It will be interesting to follow it, as I still suspect it to be de-orbitted, perhaps later this year. The East plane midnight KH-11's USA 161 (2001-044A) and USA 224 (2011-002A) will start to emerge from darkness about mid-April and have currently not been seen for several months. 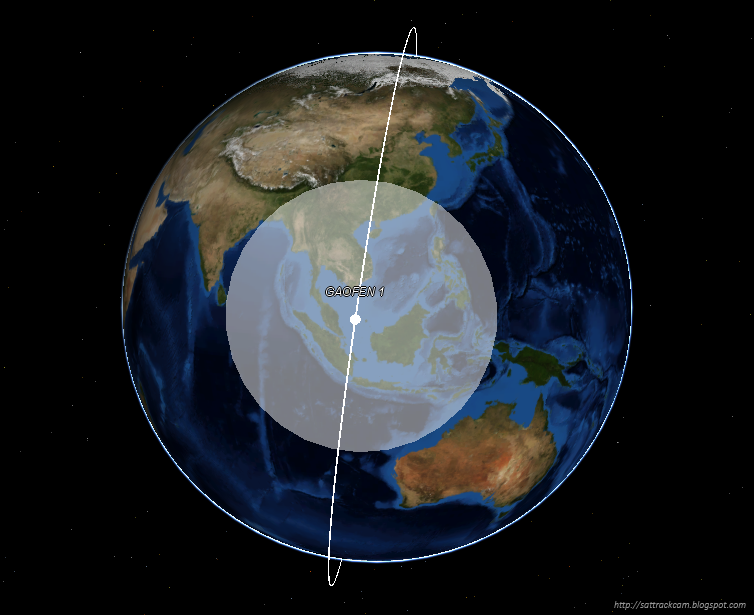 Reconnaissance satellites - Chinese and US - are suddenly all over the news, in connection to the mysterious disappearance of Malaysian Airlines flight MH370 on 2014 March 7 (UT: local March 8th). 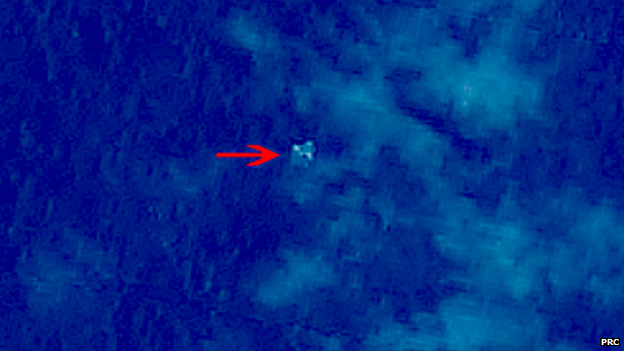 There is a crowd-sourcing initiative to look for aircraft debris in commercial satellite imagery; the Chinese thought one of their reconnaissance satellites had photographed such debris on March 9 (but it turned out to be unrelated); and US authorities said there were no signs of an explosion in data from US infrared Early Warning satellites. Let us look at the latter two cases. What satellites were used to look for an explosion and for debris? First, the reported non-observation of a mid-air explosion by US military infra-red Early Warning satellites. 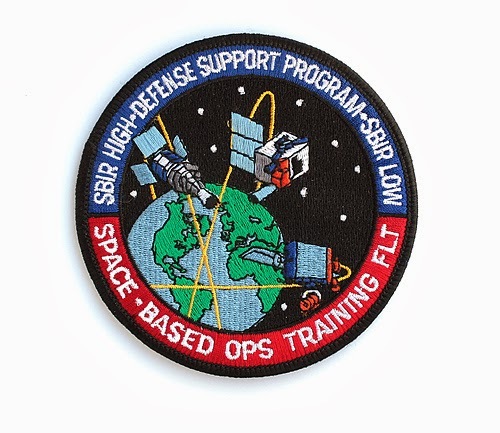 Two such systems exist: the older DSP (Defense Support Program) and the newer SBIRS (Space-Based Infrared System). Both US systems are dedicated to detect ICBM launches and have a semi-global coverage. 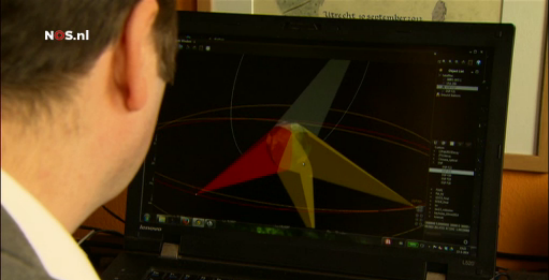 They use infrared telescope equiped satellites to look for the infrared signatures of rocket launches. They also detect other transient infrared events such as meteoric fireballs, re-entering spacecraft, surface detonations and, it is claimed, exploding aircraft. According to the news reports, the SBIRS network was used to look for any traces of a mid-air explosion of flight MH370. 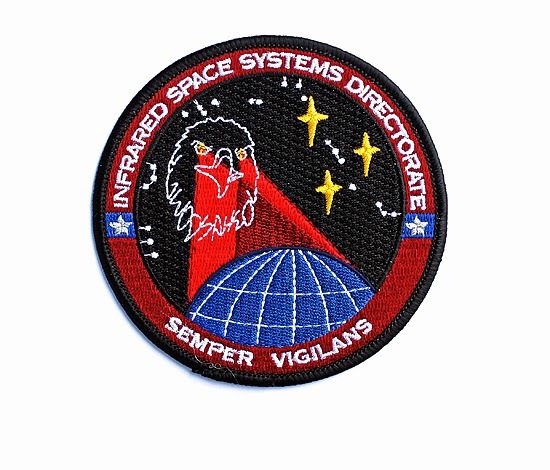 Defense specialists quoted in the news article claim that the SBIRS system is capable to detect such mid-air aircraft explosions. 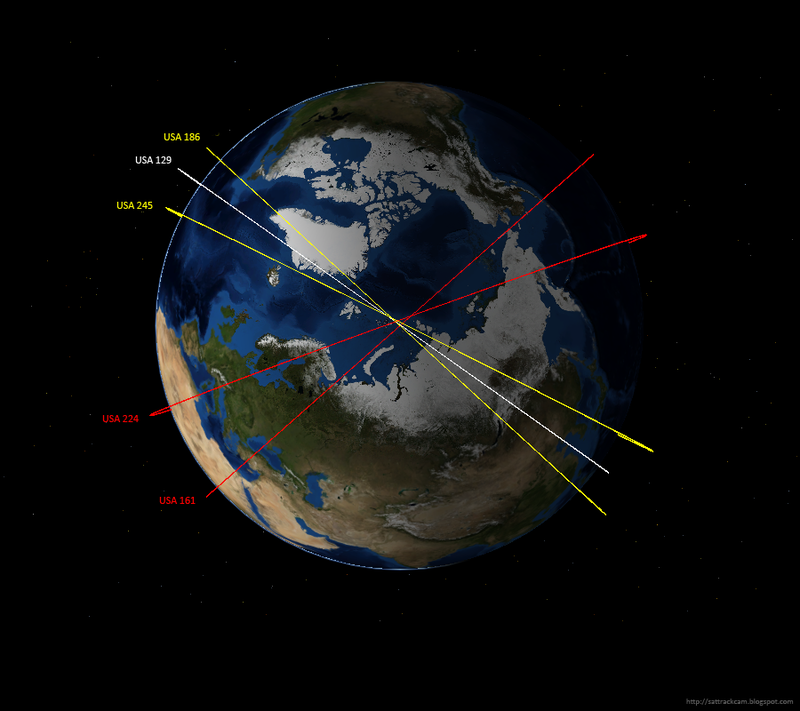 SBIRS currently consists of four satellites (see image above): two satellites in Geostationary orbit (SBIRS Geo 1 and SBIRS Geo 2, 2011-019A and 2013-011A), and two satellites in a Highly Elliptical Orbit (USA 184 and USA 200, 2006-027A and 2008-010A) with a SBIRS package piggybacked on to them. On March 12 a Chinese government website released military reconnaissance satellite images of possible aircraft debris floating near 105.63 E, 6.7 N. The images were reportedly taken on March 9 near 11 am (presumably Beijing time). They later turned out to be unrelated to the missing aircraft (or rather: they have not been found by searching ships). 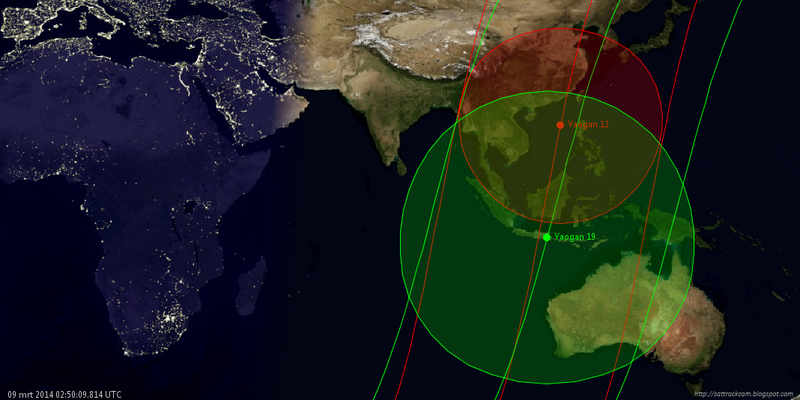 China orbits several optical reconnaissance satellites, in the Yaogan and Gaofen series. According to analyst Brian Weeden, the images were likely taken by Gaofen 1 (2013-018A), as this satellite reportedly has enough resolution. The listed time of "March 9, 11 am" corresponds to 9 March 3 UT. 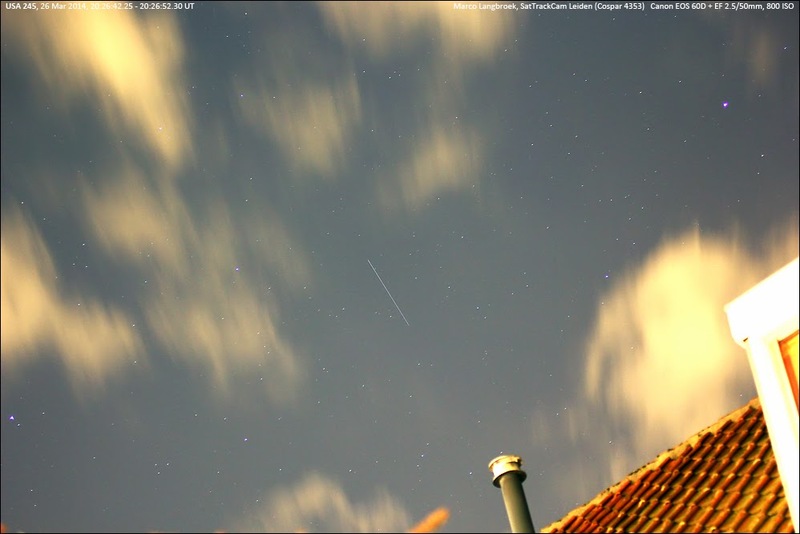 Gaofen 1 made a pass over the area at 3:40 UT, almost right overhead. Note added 18/03/2014: there is a follow-up post here about the Inmarsat 3-F1 detection of ACARS ping-backs from the aircraft, and the potential use of SIGINT satellites.